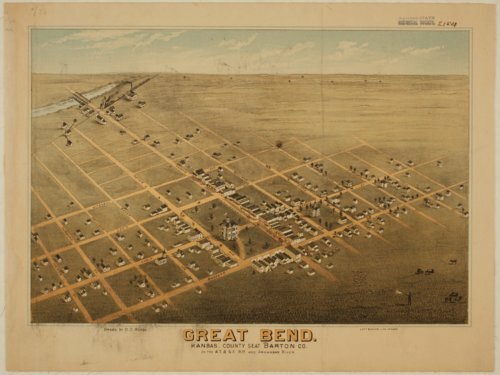 This colored lithograph is a bird's eye view of Great Bend, the county seat of Barton County. Great Bend is located on the Arkansas River and the route of the Atchison, Topeka, and Santa Fe Railroad. The Courthouse is visible in its own "square." The image also shows the business district, churches, a school, and residences but no buildings are identified. Street names are given. This lithograph was done fairly early in the town's existence. The image was drawn by D. D. Morse and published by Lott & Zeuch Lithograph, Chicago, Illinois.